I LOVE books! If you do, then you should like this post because this is about books! 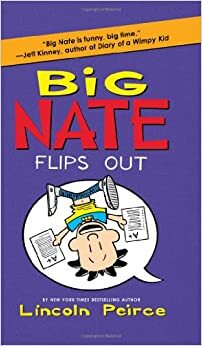 Big Nate is a series of books and most of the books are comics! It's really funny and I really like it! It's about him making a promise to his friend and he broke it...could they be friends again? I learned that Big Nate was really messy, but he got hypnotized and then he became neat! These books are about immortals and their adventures, but the most special thing is that they are really good friends! My favorite books are Athena the Wise, Aphrodite the Diva, The Girl Games, and Pandora the Curious! I learn a little about Greek mythology in these books. I learned names of different gods and goddesses. I like Thea Stilton Legend of the Fire Flowers (but I also like the whole series!). It's about five mice that are best friends, that travel the world and go on journeys. No spoilers! I also like it because I learn about different places. For example, I learned interesting facts about Peru and also France. Did you know that people in France are obsessed with clothing? I learned that some people in Peru care for sheep and goats. I hope you will like these books as much as I do! My favorite series so far is the Goddess Girls series!